An hotel can have the characteristics of a person. It can be male or female, extrovert or introvert, glamorous or sober. As with a person, what we experience now is probably a mixture of nature and nurture, of what was put into the original enterprise by its ‘parents’ and all those things which have happened over the subsequent years. I have – with people – a fondness for the quietly elegant. You know the sort I mean: the unmarried cousin (male or female) of mature years, who always dresses well and in whose calmness is a suggestion of an interesting life, lived to the full. I like to find this sort of personality in hotels, too. And in Düsseldorf I found the hotel equivalent of such a cousin. 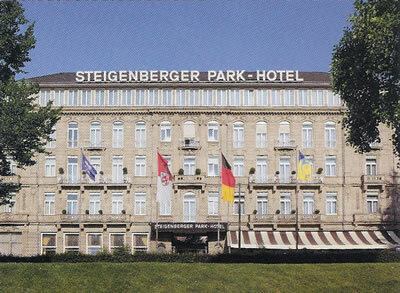 It was the Steigenberger Parkhotel. 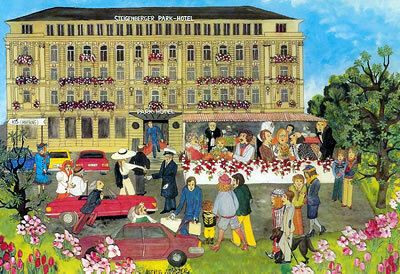 Built in 1902, the Parkhotel shows a face to the world which is gently impressive. Its façade is in the Classical style, but there is modesty in its proportions. It sits quietly at the top of Düsseldorf’s most prestigious avenue of shops, the Königsallee, and seems content that the neighbouring Hofgarten should attract the attentions of the passers-by. 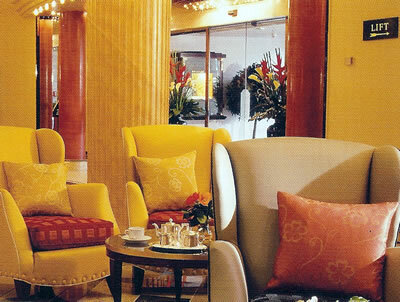 A few steps away, around the corner, is the entrance to the city’s Opera House, and – for those performers who choose to lodge so conveniently – the Parkhotel offers a retreat from the histrionics and excitements of the stage. 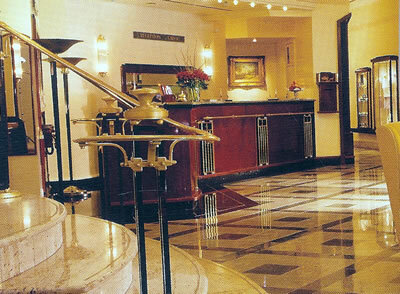 I was quickly checked in, and then it was a pleasant stroll across the spacious entrance hall to the lift. 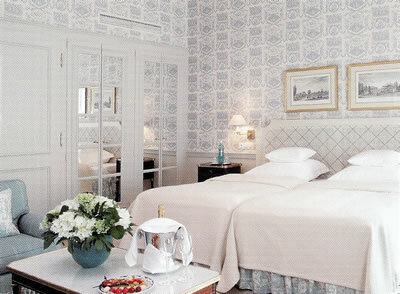 Room 206 was a ‘Deluxe twin’ (208-340 euros a night, bed and breakfast for two, according to season). From the picture, you will gather that this was a chamber of moderate size, decorated in shades of light blue and grey. Its tiny entrance hall was illuminated by a light which came on automatically, whenever the outer door was opened. 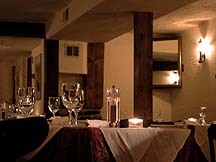 Within the room I found that the table lamps could only be used in conjunction with the chandelier. This imposed upon me a harsh overhead light which was not to my liking. I mentioned my problem to the folk at the Reception desk, and the chandelier – in some mysterious way I could not fathom – was disabled forthwith. This, after all, is what constitutes good service: members of staff who listen to what you want and then provide it. This accommodation was well-equipped. Within the ample fitted wardrobes, behind mirrored doors, was a personal safe. The wall-mounted television displayed a digital clock, so that I could know the time when I was sitting on the sofa. Through the French window was a small balcony, although – as it was above a busy street – the temptation to use it was not great. Quietness was assured by very efficient double glazing and almost noiseless air conditioning. In the black and beige bathroom, under four spotlights, I found a pair of wash basins, a tub of modest dimensions and a separate shower. Regular readers will know that I like to examine hotel corridors. Here they were spacious and bright, and contained some interesting tapestries and good furniture. My picture shows me beside a couple of these pieces. 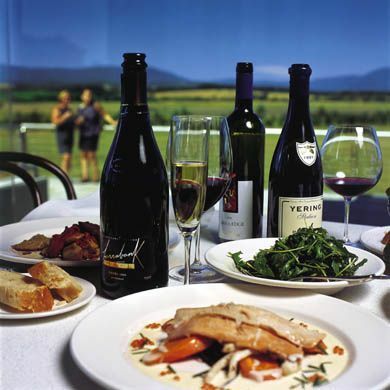 In good weather the hotel’s dining room, the Restaurant Menuett, makes use of its terrace, overlooking the park. I found this a delightful place for dinner. There is always something particularly enjoyable about eating in, or near, a garden in the middle of a big city. The tablecloths were yellow, the metal chairs (with cushions) were white, my fellow diners looked prosperous and content and, opposite me – presiding over the entrance to the Hofgarten – was a fine statue of the writer, Heine (one of the town’s more celebrated sons). Thus did gastronomy and literature happily unite. Waiters and waitresses in neat uniforms lifted silver domes and poured wine into Schott glasses, as the tinkling of a piano drifted in from the bar. To increase my pleasure, on my several visits, I was looked after particularly well by the maitre d’, Christian Soltys from Münster. He is a fine fellow, with a ready smile, and possesses that combination of friendliness and efficiency which is so essential to his profession. The 120 wines on the list range in price from 25 euros for a red from Württemberg to 600 euros for 1993 Château Margaux. (The 1998 Latour for 580 euros would probably be a better bet.) Krug Grande Cuvée champagne is 200 euros, and the 2000 Dom Pérignon is a bit of a snip at 160 euros. The 2004 Cloudy Bay sauvignon blanc from New Zealand is 61 euros. From my drinking, I liked best two bottles selected for me by Herr Soltys: the 2005 Rossj-Bass chardonnay from Mr Gaja, toasty, with a superb structure and discreet fruit, and a claret with a subtle, complex, mixture of black plums and soft tannins (Château Petit Village, Pomerol, 1999). I returned each morning to the restaurant terrace to break my fast with comestibles from the buffet. Under the striped awning, I tucked into melon, pineapple, Honey Puffs (a rare treat, reminding me of my childhood), onion omelettes and bacon – all washed down with coffee from silver pots. My concluding cappuccini brought to an end these leisurely starts to my days in Düsseldorf. 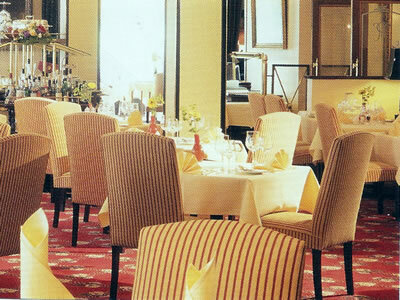 Calm, sober, well turned-out, mature and respectable – I like the character of the Steigenberger Parkhotel. Königsallee 1a, 40212 Düsseldorf, Germany.